The new Bugaboo Bee5 is here, and wow, it’s a beauty. Not only can you customise it with countless different colour combinations, but now Bugaboo have released their first limited edition version – the Bugaboo Bee5 Tone. Check it out. 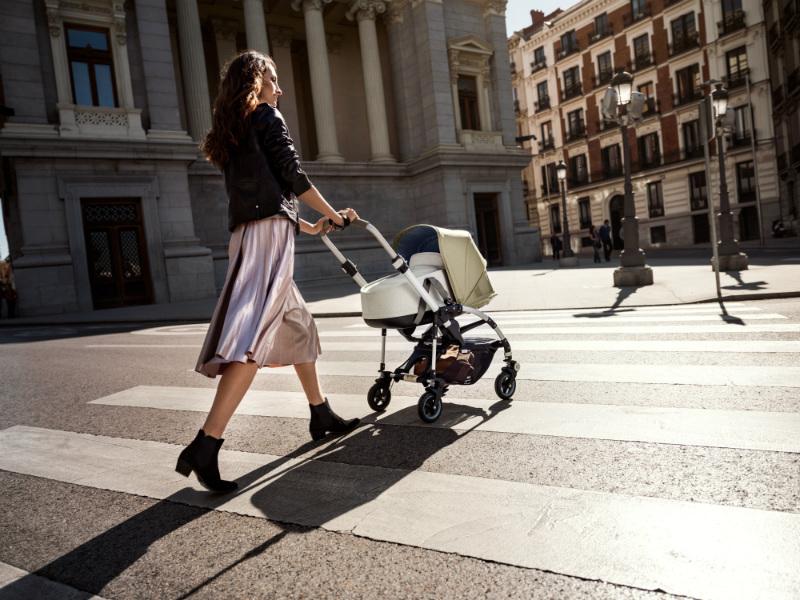 The Bugaboo Bee5 is specifically designed for busy parents on the go – perfect if you’re trying to navigate city streets with your newborn or toddler. The clever, manoeuvrable design includes independent four-wheel suspension, smooth steering and leather grip handles, so it basically drives like a dream. Your child’s also going to love the comfy padded seat, which not only grows with them, it also reverses, reclines and extends in just a few clicks. Major bonus points for the neat one-hand, one-piece fold that makes jumping on a train (or storing at home) a breeze. What really sets the Bugaboo Bee5 apart are the styling options. This is the ultimate customisable stroller, so you can style and restyle whenever you feel like an update. And it’s super easy. Just pick whichever colours and fabrics you like, then switch out various parts of the stroller – including the chassis, extendable sun canopy, seat fabric, bassinet fabric, grips and wheel caps. What’s more, the autumn release of a new limited edition Bugaboo Bee5 Tone (pictured) means all the hard work has been done for you. The Bugaboo Bee5 Tone has been designed as a total concept using an all new colour palette in shades of taupe, off white, grey and lavender blue. The natural taupe takes centre stage, from the Tone’s sun canopy, through its stylish details like the hand-stitched leather-look handlebar. The seat is a unique two-tone fabric in a blended shade of taupe and off white, while the stroller’s lavender blue lining and matching wheel caps provide an offbeat edge. 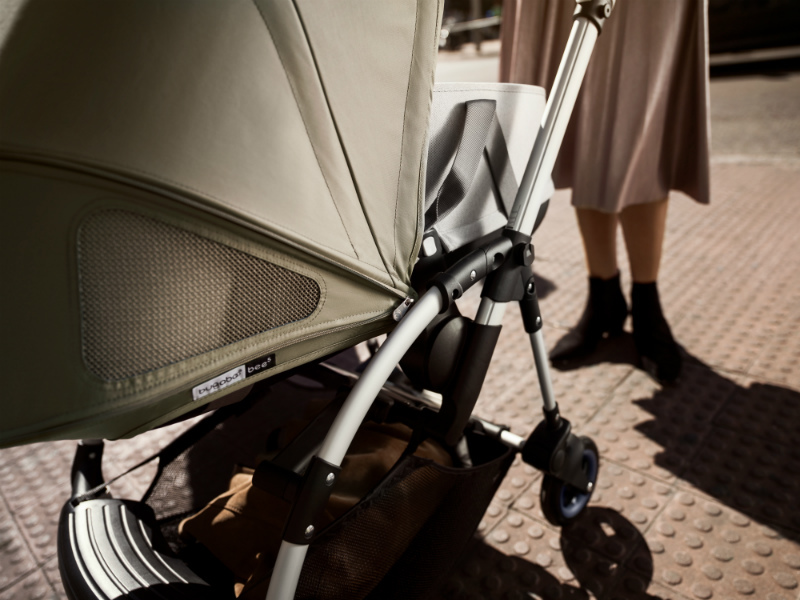 As well as the unique comfort and styling options, the Bugaboo Bee5 also boasts over 100 new parts. There are integrated attachment points for accessories, so you don’t have to use adaptors to attach everyday accessories like the Bugaboo Cup Holder, Parasol and the Comfort Wheeled Board. Instead, you just click them directly onto the stroller and you’re ready to go. In addition to these lovely and extremely handy accessories, there are of course the classic essentials that you get with every Bugaboo Bee5, including a rain cover, an under seat basket and extendable sun canopy. Perfect for when you’re out exploring the city together. The Bugaboo Bee5 is the most comfortable and stylish compact stroller you’ll find. Light and manoeuvrable, it’s a smart choice for discovering the world with your little explorer. It’s available worldwide, with prices beginning from $1079.